S-5! 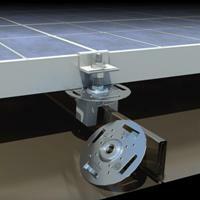 are the market leaders when it comes to seam clamps & PV kits for metal roofs. S-5! 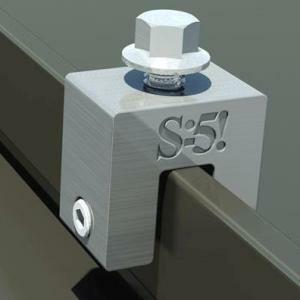 clamps attach to the panel seam by the tightening of two "bullet-nosed" stainless steel setscrews against the seam material. (This is usually done with an industrial grade screwgun.) The setscrews compress the seam material against the opposite wall of the clamp. They will "dimple" the seam material, but will not penetrate it. Threaded holes in the clamp (and stainless hardware provided) enable the easy attachment of various ancillary items to the clamps.